How Can You Get Rid of a Winter Flea Infestation? It is often wrongly assumed that flea problems only happen during summertime. Fleas can appear at any time of year, so an infestation can occur during winter, just as in summer. Essex and Suffolk Pest Solutions are highly experienced in issues surrounding flea control. Fast, efficient and discreet, we handle pest control in Colchester, Ipswich and a wide surrounding area, including Stowmarket and Witham. 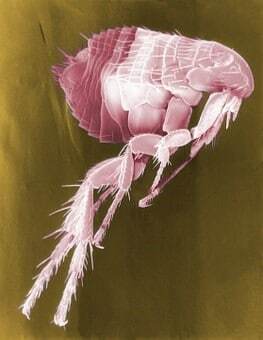 Fleas are wingless insects around 2mm long, and the females can live for up to 2 years if left untreated. Cat fleas are the most common, and are a different species to bird and dog fleas. Unfortunately, once you see a flea on your pet, it means they will become a problem not just for the animal but for the whole household. Fleas don’t just live on pets, but can also set up home in the carpet, bedding and soft furnishings all around the home. One of the most worrying myths is that you don’t need to treat your pet for fleas in winter. In fact, animals can get fleas all year round, so if owners stop treating in cold weather this can lead to their pet and their home becoming infested. A healthy pet is just as likely to suffer from a flea infestation as a sickly animal. Also, it is not just outdoor animals which get fleas. Cats can get fleas just as readily even if they are kept indoors and do not go outside. Winter treatment is, therefore, just as important for these pets. Fleas are easily brought into the home or business premises. Cats and dogs with an infestation can leave these pests behind to become embedded in your home. Once you notice your pet itching, especially around the neck area, it is important to act immediately, before the flea population explodes and the issue becomes worse. Even if you don’t have pets, there could still be fleas in your home. For instance, when you move into a new house, it is possible that the previous owner had pets which left fleas behind. With the large number of houses being sold and rented, this is an issue affecting many people in towns across East Anglia, including Colchester and Ipswich. However, it is not just cat and dog fleas that can be an issue and lead to a need for flea control. Empty birds’ nests can also harbour fleas and their larvae. It is very easy to bring these pests into your home from the park or the garden, and from other people’s homes. Once fleas are in a home or business, it can be extremely difficult to get rid of them, as the insects can stay dormant for long periods and come out when it is warm. Fleas and pests love centrally-heated homes and once you turn up the heating in winter they will come out. Humans are just as susceptible to flea bites as animals, and, although a flea will not live on a person, they will regularly bite, which can lead to scarring. With persistent scratching, bites can become infected. Over-the-counter treatments for fleas have a limited effectiveness. To control fleas, it is very important to continually wash pet bedding and vacuum all areas which the pet uses regularly. Empty vacuums in the outside bin so the fleas cannot escape back into the home. Regular grooming of your pet will help to remove some fleas, but once they have built up then further treatment will be needed. Using a flea collar or other preventive measures for your pet is advised all year round, and your vet can give guidance on this. Unfortunately, fleas can be very hard to get rid of once they are established in a building. Each female can lay enormous numbers of eggs, which will lead to even more fleas. When an infestation becomes out of control, then flea extermination from an expert is the only way to tackle these pests. Essex and Suffolk Pest Solutions are a highly accredited, local pest control company who can take care of all the problems surrounding fleas in homes and businesses, as well as tackling other pests including bedbugs, rats, mice and cluster flies. We can arrive in unmarked vans if preferred, with the minimum of fuss and will deal with fleas quickly, using the most environmentally friendly products. Customers are asked to leave the property for a few hours while we carry out the treatment. We cover a wide area including Clacton, Felixstowe, Manningtree, Sudbury, and Braintree. If you are concerned about a flea problem and need to find an expert pest company, click here to get in touch with Essex and Suffolk Pest Solutions. Do You Have a Mouse in Your House? We cover Suffolk, Essex, Basildon, Beccles, Billericay, Braintree, Brentwood, Bury St Edmunds, Colchester, Clacton-on-Sea, Chelmsford, Chigwell, Felixstowe, Grays, Hadleigh, Halesworth, Harlow, Harwich, Haverhill, Ilford, Ipswich, Leiston, Lowestoft, Maldon, Mildenhall, Newmarket, Saffron Walden, Southend-on-Sea, Sudbury, Stowmarket, Witham, Woodbridge and further afield.